The federal government is moving equipment and workers to the Big Island and promising money to help the state recover from Sunday's earthquakes, which so far are responsible for about $46 million in damage. Big Island roads: Most roads, even those with cracks, are passable although some are open to local traffic only. Worries that the Ford Ironman World Championship would have to be rerouted proved to be unfounded, Haraga said. Harbor reopens: Kawaihae Harbor is open. Rod Haraga, state transportation director, said that steel plates will cover a 14-inch crack in one of the harbor's piers. The fuel lines at the harbor are also reported to be in good shape and barges will be able to unload containers. Hospitals recovering: Maj. Gen. Robert Lee, state adjutant general, said Kona Community Hospital and Honokaa Long Term Care facility are both structurally sound, but the earthquakes set off the sprinklers and knocked down shelves so the buildings need work before the 90 patient can return. Most schools reopening: All but two public schools on the Big Island are reopening today. Only Waikoloa Elementary School and Honokaa Elementary School remain closed. Damage estimates: The damage from Sunday's earthquakes was estimated at $46 million as of yesterday. But that total was expected to rise. Yesterday, President Bush declared a major disaster for the entire state, opening up federal relief and recovery assistance. Immediate help includes a 90-person Federal Emergency Management Agency team to begin surveying the damage. Damage to seven schools and a harbor on the island of Hawaii accounted for most of the preliminary figure, said Janet Snyder, press secretary for Hawaii County Mayor Harry Kim. Damage to businesses, homes, roads and bridges accounted for the remainder. "These figures are going to change radically, I believe," because information continued to stream in, Snyder said. Damage included $31 million for schools, $8 million at Kawaihae Harbor, $4.89 million to businesses, $650,000 to residences, $800,000 to roads and $750,000 to bridges. Yesterday afternoon, 20 FEMA engineers and other workers flew to the Big Island. The declaration was requested by Gov. Linda Lingle, who had declared a state disaster Sunday afternoon. "We appreciate the prompt response by President Bush to declare a major disaster for the state," Lingle said. Federal workers will team up with state workers and the Hawaii County civil defense to start assessing the damage caused by the two earthquakes and the series of aftershocks off the Big Island's Kona coast Sunday. Lingle said it was too early to put a dollar estimate on the damage done, including county roads and harbors, schools and private buildings, but she predicted that the estimates would grow rapidly. "We are continuing to see damage that we did not first see, and there are going to be a lot of other impacts," Lingle said during a news conference. The president's disaster declaration makes federal funding available to state and local governments in the counties of Hawaii, Honolulu, Kauai and Maui for debris removal and other purposes, the White House said. Certain nonprofit organizations also may be eligible. Assistance to individuals was not immediately included. 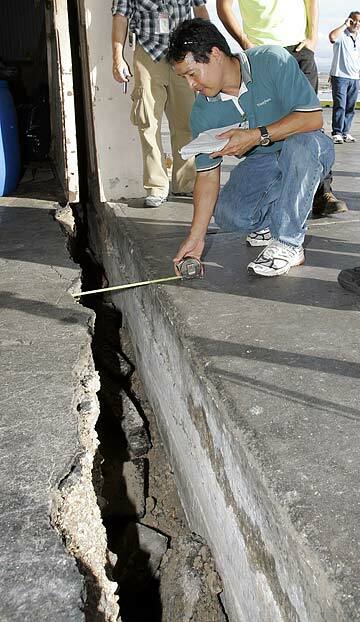 Carter Luke of the Hawaii Department of Transportation yesterday inspected damage at Kawaihae Harbor caused by Sunday's quakes and yesterday's 4.0 aftershock. A portion of the Big Island harbor reopened for business yesterday. A FEMA team arrived on the Big Island at midday to begin surveying damage. "This is an earthquake zone, so watch your step," FEMA official Jeff Lusk told the team in a briefing before they flew from Honolulu to the airport near Kailua-Kona. Lusk also warned of aftershocks. Indeed, a 5:26 a.m. jolt yesterday widened a crack on a pier at Kawaihae Harbor and further damaged a second pier, said Rod Haraga, state transportation director. The temblor was listed at magnitude 4.0 on the Web site of the Hawaiian Volcano Observatory after review by a seismologist. The harbor partially reopened yesterday. The concrete pier where container ships offload their goods pulled away from the main port area where those containers are processed. The gap was as wide as 13 inches at some spots . The port is the lifeline of the west side of the island. "See those people over there? Everything they had for lunch, everything they had for dinner came through this port," said Elton Suganuma, the marine cargo specialist for the port, gesturing at a tourist restaurant. At schools on the Big Island that have been closed, teachers and custodians cleaned up classrooms and engineers assessed the structural integrity of buildings. All schools except Honokaa Elementary and Waikoloa Elementary were expected to reopen today. WHAT DOES DISASTER DECLARATION MEAN? The declaration means the federal government will pay for debris removal and emergency protective measures, up to 75 percent of the cost. The feds will also pay for 75 percent of the cost of National Guard operations related to the earthquake emergency. Also, the declaration allows FEMA to provide needed food, shelter or communications help. About eight classrooms and the cafeteria at Kealakehe Elementary School suffered ceiling tile damage that collapsed during the tremors, according to vice principal Teddy Burgess. Staff members cordoned off the affected area in the cafeteria with a dividing wall, forcing more than 1,000 students to use the remaining half during lunch. "We needed 14 lunch tables. ... We're going to be kind of cramped in there," Burgess said. The quakes were the second major natural disaster to hit Hawaii this year. In April, heavy rains pounded the islands, causing severe flooding, contributing to the failure of Ka Loko dam on Kauai that killed seven people and causing a major sewer line to rupture, closing Waikiki beaches. The state estimated flood damage exceeded $50 million and are spending tens of millions more on replacing sewer lines. Star-Bulletin reporter Rosemarie Bernardo and the Associated Press contributed to this report.